You can contact Santa Guy any time by clicking on the link below. Available everyday from October in the run up till Christmas, delivery times are as fast as his sleigh. Plus the Elves are always on hand to help you out. 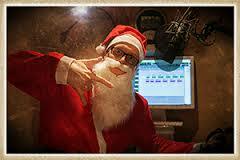 Contact Santa@VoiceoverGuy.co.uk Thank you for dropping by Santa Guy, aka Guy Harris. Have a good look round the site, download the freebies, listen and discover why Guy is one of the UK’s busiest voices with a plethora of voices – Hear more at his main website VoiceoverGuy.co.uk. Head over to the Audio pages to check out what Guy can do for you as the Voice of Santa on your brand this festive season. Contact Santa – Go on… It’s Christmas!